Casey Nelson skates the puck into the offensive zone vs the Frenso Monsters last homestand. 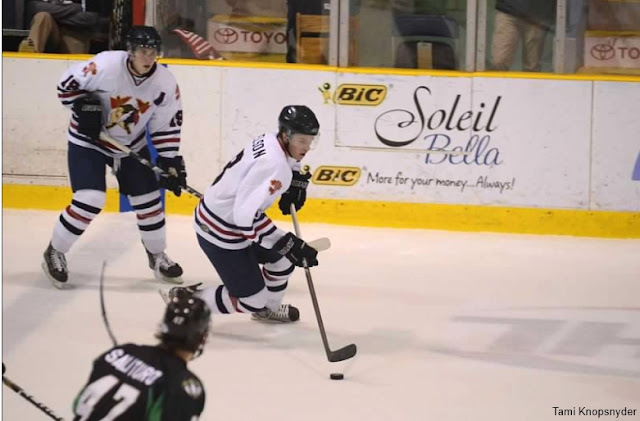 This upcoming weekend the Johnstown Tomahawks will face the Jamestown Ironmen. It's the last two home games of the season for the Tomahawks, though they will have four more games away from the CCWM (at Kalamazoo and at Jamestown). If you haven't had a chance to come out to see a game this year, or if you just haven't been to a game in a while, this weekend will be the last time to watch several of the Tomahawks' players in a Johnstown jersey. Three of the players will be heading to play college hockey, while four are going to be ineligible to play due to their age (you can only play in the NAHL from 16 to 20 years old, though you can play when you're 21 years old if your birthday happens during the season). There hasn't been a press release yet for his commitment but according to NAHL.com, Nelson, will be playing for Minnesota State-Mankato (WCHA, D1), next season. Nelson is the best defenseman for the Tomahawks this season. He's got a great shot, he's one of the better skaters on the team, and he has good size. For all those old Johnstown Chiefs' fan like myself, Nelson reminds me a lot of defensmen, Mike Knight, only less physical. Spencer is only nineteen years old but has decide that he will begin his college hockey career starting for the 2013-2014 season with University of Vermont (Hockey East, D1). Spencer was the Tomahawks first ever draft pick in the NAHL. Truehl will be taking his game to Air Force Academy (Atlantic Hockey, D1) at the end of this season. Truehl has been the work horse for Johnstown, playing in 32 games this season. He's able to make the big time saves when needed and has been pretty consistent with Johnstown this year. There have been a couple of games where he's looked shaky but at this age that's going to happen every now and again. Last month we did an article about Truehl's career before he joined the Tomahawks. You can read that article here. Kontny is second on the team in points with 39 in 54 games, but he leads the team in minus rating with a -11. He will go in the record books as the Johnstown Tomahawks' first team captain in team history. Kontny isn't a flashy player, and some nights you might not notice him out on the ice but he always seems to find a way to have multiple point night games. As of today, Kontny doesn't have a college commitment but with his skill you'd think it's only a matter of time until he does. Bergh is the type of defenseman that you don't notice out on the ice, but when it comes to defenseman, if you don't notice them it probably means they're doing their job. Bergh has 20 points this season which is a career high. Wright is probably the team's best defensive forward on the team. Currently he is tied second on the team in +/- rating with a plus 4 rating. Even when the team has a horrible game, Wright, is always a bright spot. Wright plays on a line with McDonald and Wallace. When all three are on their game, they are a line that's very hard to deal with. Former Johnstown Chiefs' player comparison: Sean Berkstresser. Smith-Mass hasn't had a great season stat wise. Three of his five points this season came in his first six games. Then, vs Michigan, during a first period fight, Smith-Mass injured his shoulder and missed about two months of the season. Since then he's been in and out of the line up, even seeing some time on defense. Mike Sandor turns 21 years old on September 14th. If the season starts before then (it started on the 8th this year) he'll be able to return for one last season. Williams and Sandor will also age out. Williams is 20 years old right now. He'll turn 21 on December 12, 2013. Since he'll turn 21 during the season he'll be able to play in the NAHL next season. Same thing with Sandor. What if the Tomahawks Jersey Looked Like This?